If you ask longtime sailors to explain their attraction to the activity, they’ll say that they love the feeling of freedom, or the competition (if they race), or the time with friends who sail, or the constant challenge. But if you probe more deeply to understand what underlies the strength of their passion, most sailors will explain that they were led to sailing by someone whom they respect, and who took the time to help with sound advice and hands-on training as they learned. Most longtime sailors learned to love to sail from a mentor: a grandmother, a dad, a close friend or a camp counselor. Indeed, people who are lucky to have found a mentor in anything — sailing, singing, career — are often also people who have found ways to live healthier, happier, more interesting and more meaningful lives. And it’s a two-way street. Mentors benefit in precisely the same way. It seems that if we are privileged to find a protege’ (a daughter, niece or neighbor) with whom to share the things we love to do, we too lead healthier, happier, more interesting and more meaningful lives. One of the key findings from the research for the book Saving Sailing is that the absence of mentoring is directly correlated to the decline in participation in sailing; which is better explained as a decline in devotion to group free-time pursuits made worse by crushing pressures on family time. Americans still generally think sailing might be cool and an interesting thing to learn. They just can’t find someone to lead them to it and they don’t take the time to do it themselves. This doesn’t mean that there is a shortage of folks who could mentor another in sailing. It means, instead, that very few of us are doing it. So what is a mentor and how does one start mentoring? It’s ironic that the character in Homer’s Odyssey named Mentor, and from whom we get the word, is an old man with little to offer. Perhaps to sidestep the myth that the act of mentoring is the dominion of gray-haired gurus, the goddess Athena takes Mentor’s likeness as she guides young Telemachus into and through a challenging life. In fact, Mentor isn’t the mentor at all. Athena, goddess of wisdom, strength, strategy, craft, justice and skill (among other things) is the real source of Telemachus’ strength and intellect. The only thing that good mentoring demands is the confidence of experience. You don’t have to be old. You don’t have to be a man. You don’t have to be rich. You don’t have to be a hero or a professional. You just have to have been there, and you have to want to return to help someone else go there, whether the destination is a place or a feeling or a skill. This doesn’t suggest that a mentor must have the same innate talent or be as polished as an apprentice. The mentor only needs to understand the basic environment and the signals within it. Most important, the mentor needs to be able to apply the lessons from one aspect of life to another. This means that nearly all the 2.6 million active sailors in the US today qualify to mentor another in sailing, starting now. It also qualifies nearly every parent that can distinguish between port and starboard. 1.) We should have others do our parenting for us. 2.) We can teach as well from a distance as we can in person. 3.) We can’t find the time to help another find good things in life and find good things in life for ourselves in the process. And like Athena, mentors use their own strengths as levers for teaching. For instance, a mom that hopes to inspire a child to learn to love music through performance doesn’t have to be a great player herself. Instead, she needs to be roundly familiar with music, and able to inspire improvement. This is why, in my view, sailing schools, clubs, and community centers should vigorously move towards intergenerational sailing instruction and programming, if they hope to re-create a strong foundation for mentoring in sailing. But it can also happen on just one boat and in ways that are quite surprising. I am privileged to sail with many mentors each summer. Our boat is crewed by no less than three K-12 school teachers, all woman, ages 28 to 60, each of them so enthusiastic about sailing as supplemental education that they draw many others into it each year. And my teen daughters Kate and Elizabeth lead friends to the activity all summer long. Kate teaches 7 and 8 year-olds in the summers and some of her students have recruited their parents to learn to sail. I may be among the most experienced on board, but I learn from each of them every time we sail together. If Athena could pretend to be a wise old man to share what she knew, anyone can pretend to be a wise old man. Do you love sailing? Do you fondly recall the person or the people who helped you find the love? Then it’s time to share it. Use your passion to inspire the next generation of apprentices, so that they can become mentors themselves. And watch it take on a larger and longer meaning for everyone involved. 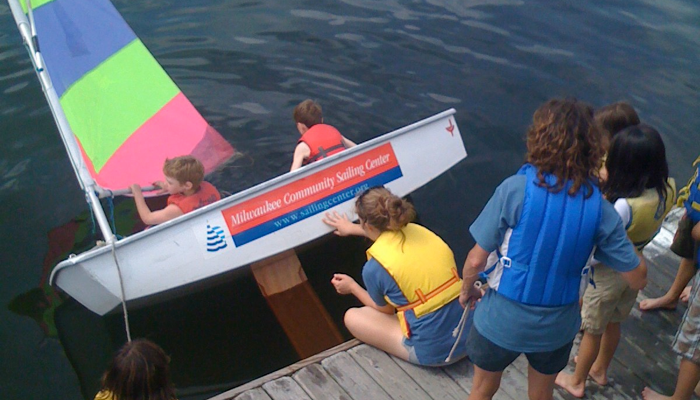 If you or your club are interested in sharing ideas, feel free to email me at nickhayes@savingsailing.com or post your ideas at savingsailing.com. You are currently reading Sailing Mentors – Not All Old Men at Saving Sailing.